Captain Three Leg kicks things off with these sounds of triumph, as if someone has just made the kill in a Tarantino movie. It's odd, but the first time I pressed play on this CD it wanted me to start the first track (Which is just over fifteen and a half minutes) around three and a half minutes. I felt like someone didn't rewind the cassette all the way back to the beginning, but this is a CD. Guitar notes come through with waves and an overall presence of darkness as well. We are trapped in the void of space perhaps, but it seems more bleak than empty. As whirrs and whooshes come through, I can hear the drums banging away. 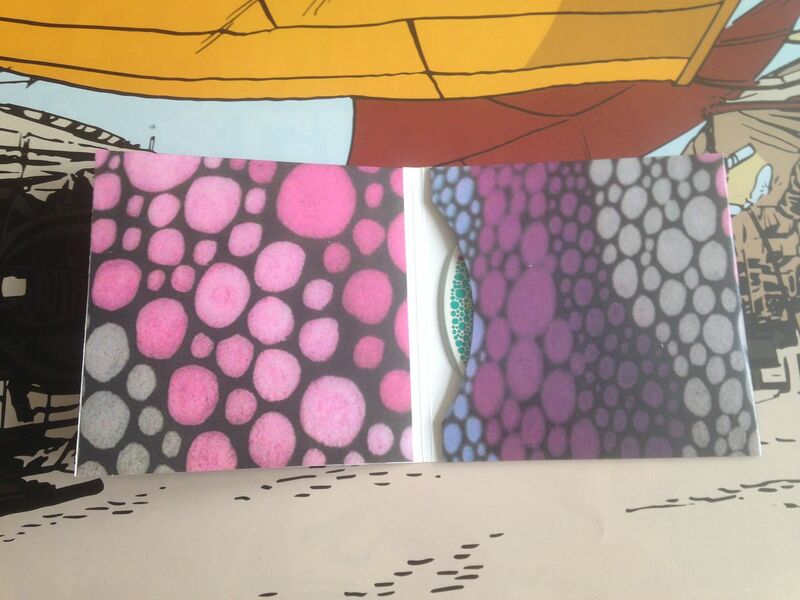 What kind of trippy space rock is this? 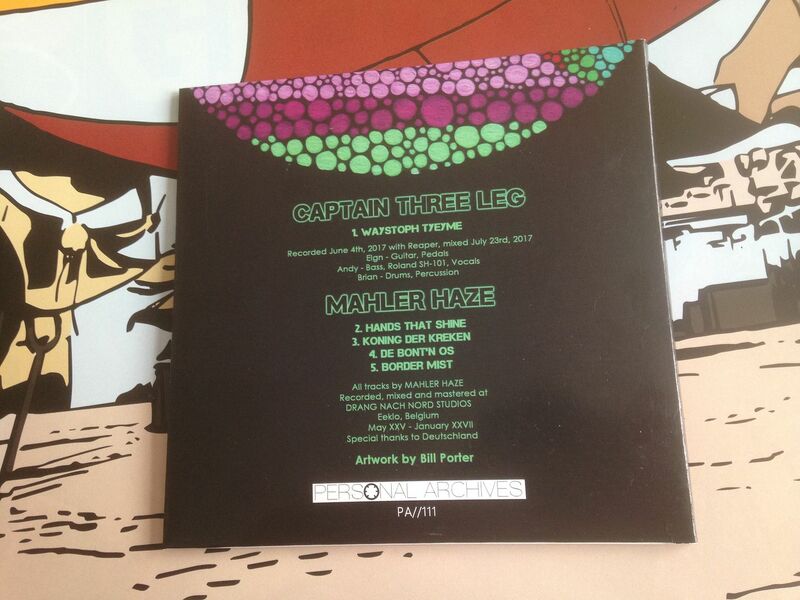 I've heard the name Captain Three Leg before but I don't think I've heard their music which is one of the reasons why I suppose this split CD appealed to me so much. I also thought they'd have more of a jazz sound because of that Sweep the Leg Johnny band. Radio frequencies find us in a quieter, more isolated place now. Only faint sounds remain, sometimes it even sounds like breathing or talking. The frequencies return as we begin to build again near the seven minute mark. It's more of a rattling with sharpness now, definitely quieter and if it didn't come out so sharp at times I'd even say ambient. At the ten minute mark someone does begin speaking. I just hear the phrase "humanity in a downward spiral" and this does feel like someone who escaped the Earth before it blew up. 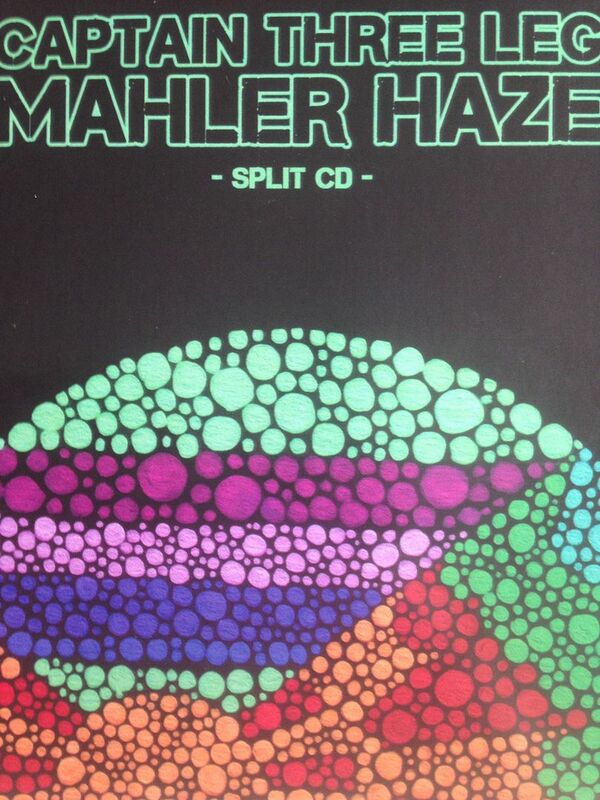 Mahler Haze starts off the flip side with these ambient strings and the trill of a xylophone. I only say the flip side because this is a split, but to be fair, these would never be able to exist as a split in the sense of a cassette because the Mahler Haze side is double the C3L side. There is an ambient calm to this and I find it to be rather fitting based upon how the Captain Three Leg piece left off. I'm not sure whether or not these two artists knew what the other was doing, but it does seem like Mahler Haze is picking up where C3L left off. As it fades out with the calm of a tranquil sea, the next song comes on with some whirrs which take us into electronic glitching. I thought this song might begin a more harsh sense of the sound here, but while there is some sharpness and even some chugging along the electronics level I thought could get harsh is staying pretty well drone. The static does eventually become a heavier feedback of distortion and it ultimately takes over the entire song. Near the end it seems as if an airplane is taking off. Darker pulses and an overall eerie feeling like we are in a horror movie but also possibly a sci-fi movie which could be somewhat scary like "Alien" comes out in the fourth song. Synths drone through with a slight ringing and a slight buzzing behind it all. This is like something out of a John Carpenter movie. Forget "Alien", this could be a movie like "The Thing". "Border Mist", which is the final track overall on this CD, opens with that screechy static and somehow maintains those horror movie tones. It has a distinct feeling like it is set in space though, so it does remind me still of my idea of this being similar to the movie "The Thing" now, which is amazing. 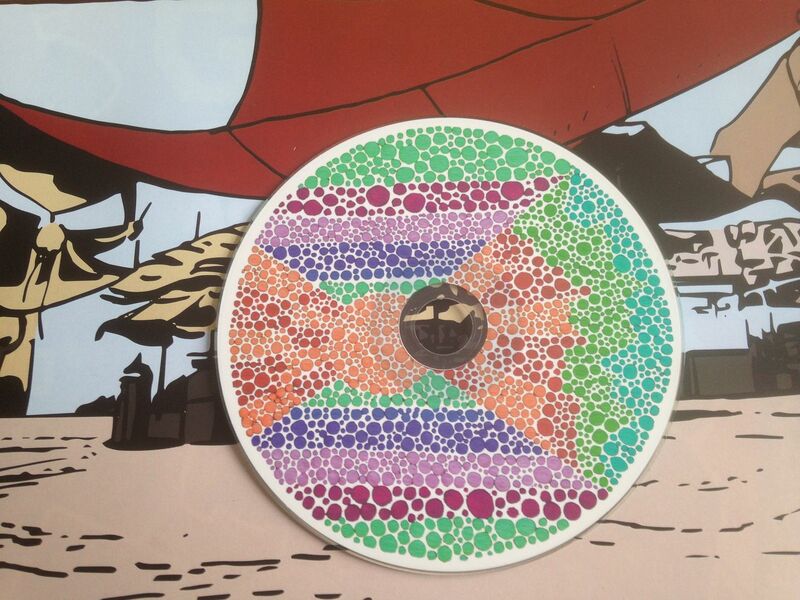 The way these two artists work together even if they do not realize that they are makes this split CD that much better. 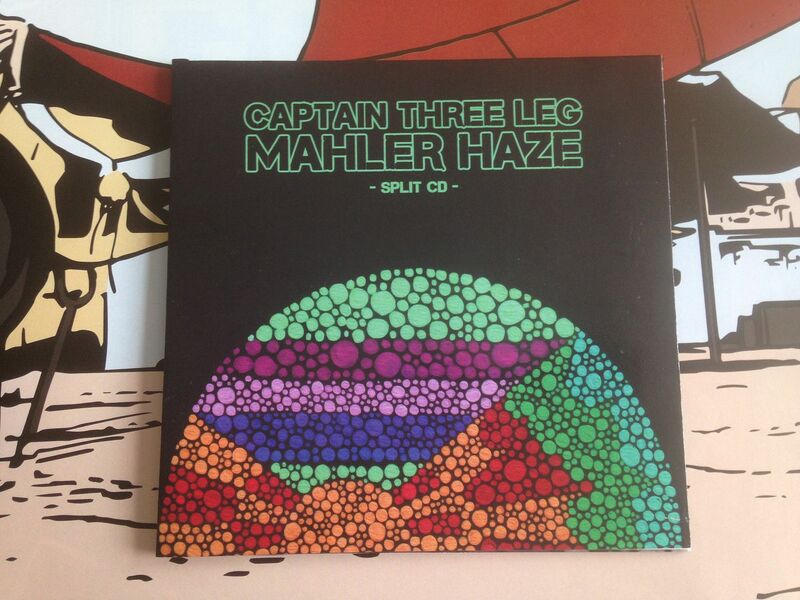 You should have this in your collection as a fan of Mahler Haze, but hearing Captain Three Leg for the first time on it also makes it that much more worthwhile. Sometimes splits can run like opposites but this one flows where it's just different enough that you can tell where one artist ends and the next one begins but yet maintains a consistency from start to finish that is just so fluid.